The Alamo Chapter, National Society Daughters of the American Revolution (NSDAR or DAR) welcomes you to our website! No name is more revered in Texas history than the Alamo, and it was an appropriate choice for a DAR Chapter in San Antonio. Our historic shrine has been designated a U.S. World Heritage site by the United Nations joining key landmarks of the American Revolution such as the Statue of Liberty, Philadelphia's Independence Hall, and Monticello, Thomas Jefferson's Virginia Home to name a few. In taking the Alamo Chapter NSDAR name, we try and make a difference in our community each and every day! 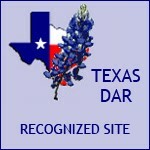 Welcome to the Alamo Chapter NSDAR. 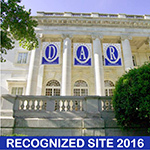 Established in 1913 we have a long and proud history of service supporting our three DAR objectives: Historical Preservation, Education, and Patriotism. We support our organization by attending state and national DAR meetings. If you like any or all of these events you have chosen the right chapter. We are all about service. If you have additional ideas for projects or events, we want to hear them. If you want to participate as a committee chair, we want you to volunteer. Whatever your special talents, we want you to share them. It is through your efforts and participation Alamo Chapter NSDAR continues to grow and prosper. Welcome to Alamo Chapter NSDAR….